A long list of American fiction shows that our large diverse American landscape and frontier mind-set wield strong influence on our narratives and stories. Current day writers in this tradition include Gregory Hill (East of Denver), Ron Carlson (Return to Oakpine), and other familiar names such as Kent Haruf, Ivan Doig, Cormac McCarthy, and William Kittredge. 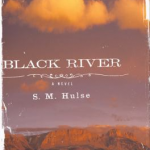 Recently, first-time author S. M. Hulse has embraced the tradition of these masters of the modern western genre in her riveting new novel Black River, a powerful character study of Wes Carver, deeply influenced by the unforgiving western landscape. Quiet and taciturn, he is a former corrections officer at a prison in rural Montana. Wes’ story opens twenty years after a prison riot during which he was maimed and tortured by a prisoner now up for parole. Wes feels compelled to testify against the man at his upcoming parole hearing, but he has also returned his hometown of Black River to scatter his wife Claire’s ashes and to make amends with his stepson Dennis. Make no mistake. This is a dark novel with all the elements of death, suicide, family dysfunction, and themes of Old Testament proportions, but Hulse guides us through memory, bitterness, and eventually forgiveness with grace. A vivid and compelling novel not to be missed. Posted in Reviews and Recommendations.